The U.S. is a nation of immigrants. But unauthorized immigrants and U.S. immigration policy have become a source of political debate, with Congress and President Obama disagreeing over the best course of action to address issues such as deportations, shielding unauthorized immigrants from deportation, securing the border, and overhauling the nation’s legal immigration system. That debate comes as the U.S. marks the 50th anniversary of the 1965 Immigration Act that has provided the foundation of today’s immigration laws. For years, the Pew Research Center has estimated the size and characteristics of the U.S. unauthorized immigrant population and surveyed Americans about immigration policy. Here are key findings. 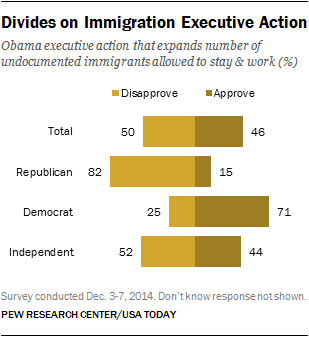 Americans are divided over the executive action President Obama announced last November expanding the number of undocumented immigrants permitted to work and stay in the U.S.
About as many disapprove (50%) as approve (46%) of Obama’s action, which could make up to 4 million people newly eligible for deportation relief, according to a survey last December. About eight-in-ten Republicans (82%) disapprove of the executive action and about seven-in-ten Democrats (71%) approve of it, with very strong attitudes on both sides. Hispanics overwhelmingly support the deportation-relief action: 81% approve, including 59% who very strongly approve. But non-Hispanic whites disapprove of it by nearly two-to-one (62% vs. 34%), with nearly half (49%) disapproving very strongly. Unauthorized immigrants from Mexico will benefit most under Obama’s executive actions. According to a Pew Research analysis, 44% of unauthorized immigrants from Mexico could apply for deportation protection under the new programs, compared with 24% of those from other parts of the world. The largest group who stand to benefit— at least 3.5 million, according to estimates of 2012 data — consists of unauthorized immigrant parents who have lived in the U.S. for at least five years and have children who either were born in the U.S. or are legal permanent residents. There were 11.2 million unauthorized immigrants in the U.S. as of 2012. 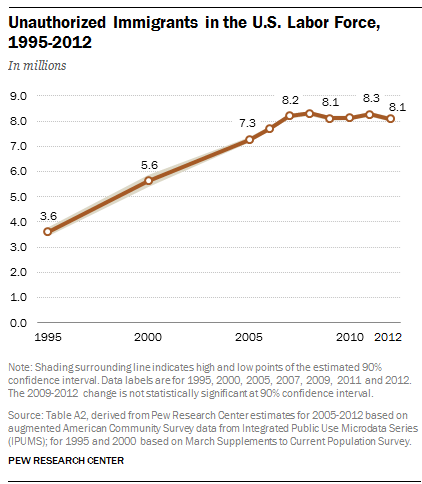 The total number of unauthorized immigrants living in the U.S. has not changed since 2009, standing at 11. 2 million in 2012. (A preliminary Pew Research estimate put the 2013 population of unauthorized immigrants at 11.3 million, statistically unchanged from the 2012 figure.) Before then, the unauthorized immigration population had risen rapidly, from 3.5 million in 1990 to a peak of 12.2 million in 2007, the year that the Great Recession began. Another major trend has been the decline in the number of unauthorized immigrants from Mexico, falling to 5.9 million in 2012 from a peak of 6.9 million in 2007. 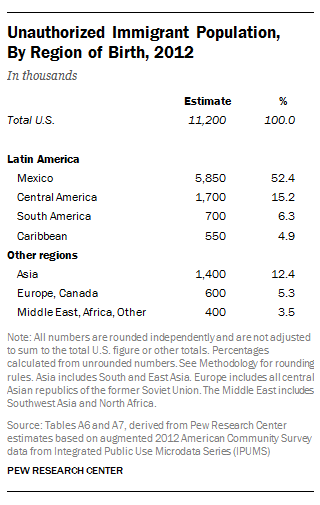 About half of the unauthorized immigrant population in the U.S. comes from Mexico. Mexico has been the top source of the number of unauthorized immigrants since at least 1995, and today accounts for about half the total. Ranking second is El Salvador (675,000 in 2012), followed by Guatemala (525,000), India (450,000), Honduras (350,000), China (300,000) and the Philippines (200,000). But largely because of a marked decline in Mexican unauthorized immigrants since 2009, the shares of unauthorized immigrants from other nations and regions have grown. The sudden reversal of a long trend of growth in the number of Mexican unauthorized immigrants probably results from both a marked decline in new arrivals and an increase in departures to Mexico. While the number of unauthorized immigrants leveled off nationally from 2009 to 2012, there were increases in seven states and declines in 14. Six states — California, Texas, Florida, New York, New Jersey and Illinois — accounted for 60% of unauthorized immigrants in 2012. But illustrating the shifting trends in immigration patterns within the U.S., five East Coast states were among those seeing increases in the number of unauthorized immigrants from 2009 to 2012: Florida, Maryland, New Jersey, Pennsylvania and Virginia. Meanwhile, the unauthorized immigrant population declined in six Western states, including California and Nevada, which have been popular destinations for those immigrants. In 13 of the 14 states where there were declines in the unauthorized immigrant population, the chief factor was the drop in the number of unauthorized immigrants from Mexico. Most Americans support a way for unauthorized immigrants to gain legal status if they meet certain requirements. 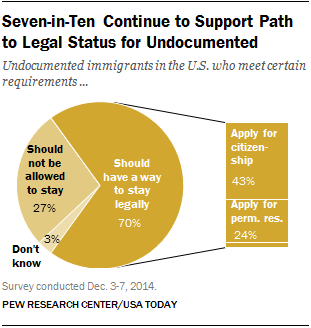 Seven-in-ten Americans support a way for undocumented immigrants to gain legal status if certain requirements are met. Most of those who support legal status think there should be a way for unauthorized immigrants to become citizens (43% overall), while 24% say the path should only include permanent residency. About eight-in-ten (83%) Democrats favor a pathway to legal status compared with 53% of Republicans. Majorities of blacks (75%) and whites (64%) continue to say undocumented immigrants should be allowed to stay in the U.S. legally if certain requirements are met. And about nine-in-ten (92%) Hispanics continue to support a pathway to legal status. Republicans are more likely to say tougher law enforcement and stepped up border security is the top priority. Democrats are more likely to favor putting equal priority on tougher enforcement as well as finding a way for those in the U.S. illegally to become citizens. About four-in-ten (41%) Americans said in an August 2014 survey that equal priority should be given to providing a path to citizenship for those here illegally and to better border security and enforcement, while 33% put the emphasis on tougher enforcement and 23% prioritized the pathway to citizenship. About half (53%) of Republicans said the priority should be tougher border controls and enforcement while just 36% favored equal emphasis on both priorities. In contrast, 45% of Democrats favored equal emphasis on both priorities while 33% said the focus should be on finding a way for those here illegally to become citizens if they meet certain requirements. Among Latino registered voters, 84% said in a Sept.-Oct. survey that creating a pathway to citizenship for undocumented immigrants should either be the top priority (46%) or just as important as better border security (38%). 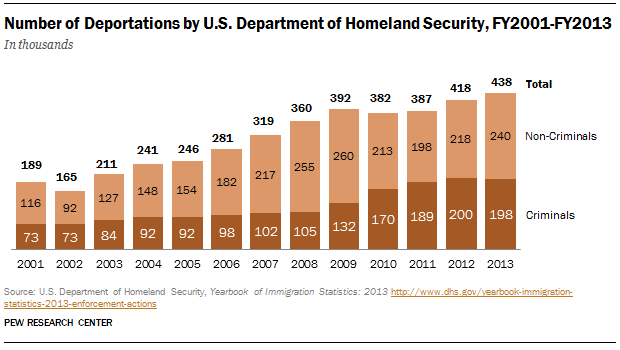 U.S. deportations of immigrants reached a record high in 2013. The Obama administration deported a record 438,421 unauthorized immigrants in fiscal year 2013, continuing a streak of stepped up enforcement that has resulted in more than 2 million deportations since Obama took office, according to Department of Homeland Security data. Up to that point, the current administration deported about as many immigrants in five years as the George W. Bush administration deported in eight years. A survey conducted in February found the public evenly divided over whether the increase in deportations was a good or a bad thing. U.S. Hispanics say relief from the threat of deportation is more important than a pathway to citizenship. Among U.S. Hispanics, a larger share — by 56% to 35% — said in a Sept.-Oct. 2014 survey that it is more important that unauthorized immigrants be able to live and work in the U.S. without threat of deportation than have a pathway to citizenship. Among Hispanic adults, immigrants (59%) are more likely than U.S.-born Hispanics (54%) to say that being able to live and work legally is more important. Among Latino registered voters, 51% say deportation relief is more important than a pathway to citizenship for undocumented immigrants. Meanwhile, four-in-ten Latino voters say the opposite. In a 2013 survey, 46% of Hispanics said they worried “a lot” (25%) or “some” (21%) that they themselves, a family member or a close friend could be deported. As the number of unauthorized immigrants levels off, those who remain in the country are more likely to be long-term residents and live with their U.S.-born children. Among the nation’s 10.4 million unauthorized adults, a shrinking share have been in the country for less than five years — 15% in 2012, compared with 38% in 2000. A rising share have lived in the U.S. for a decade or more — 62% in 2012, compared with 35% in 2000. 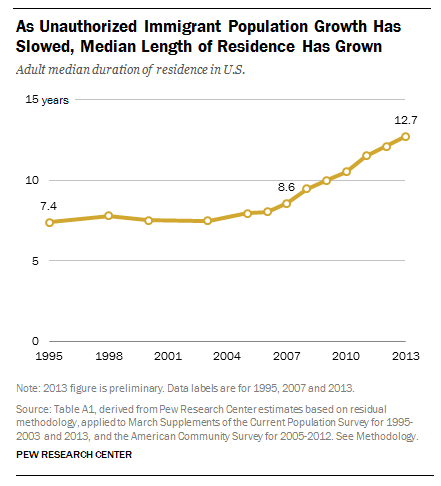 About a fifth (21%) have been in the U.S. for two decades or more, as of 2012. Children with at least one unauthorized immigrant parent made up 6.9% of students enrolled in kindergarten through 12th grade in the U.S. Among elementary and secondary school students with unauthorized immigrant parents, the U.S.-born share has grown since 2007 while the share who are themselves unauthorized immigrants has declined. Most (5.5% of all students) are U.S.-born children who are U.S. citizens at birth. 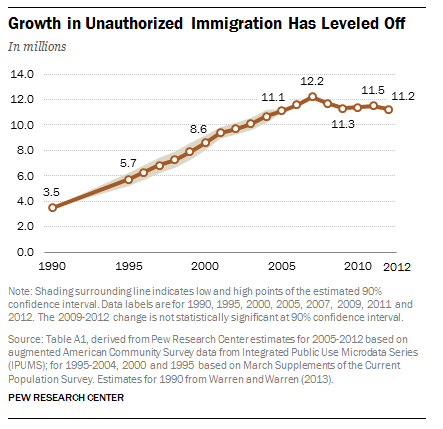 The rest (1.4%) are unauthorized immigrants themselves. Unauthorized immigrants account for one-in-twenty people in the U.S. workforce. Unauthorized immigrants accounted for one-in-twenty people in the labor force, or 8.1 million people in 2012, but the share is markedly higher in some states, especially those with high shares of unauthorized immigrants in the population (like Nevada, California and Texas). See our overview on President Obama’s 2015 State of the Union, and read our related fact sheets on privacy and cybersecurity, the economy, and energy and the environment.